If you have been asked to help organise an important event and you have little or no experience in conference planning or event management, what should you do? 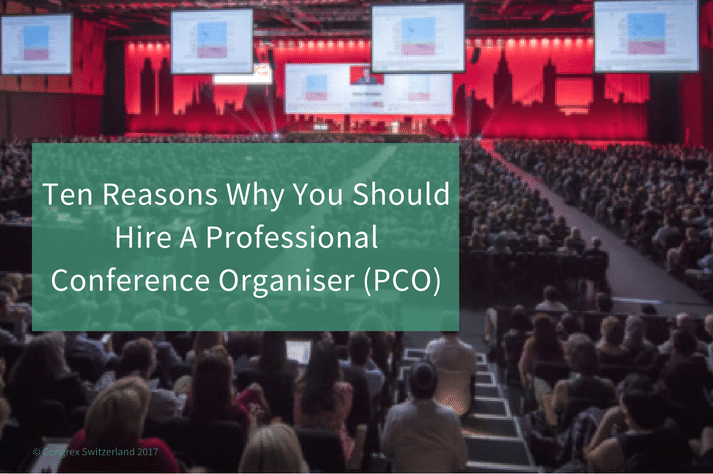 Well, there is only one answer — you need the help of a professional conference organiser (PCO). Read on for ten reasons why hiring a professional planner to organise your conference, meeting or event is worth every cent. If a budget has already been set by a conference committee, a PCO can take care of the budgeting for each element of the event, including bookkeeping and tax compliance. Streamlining financial management in such a centralised way is also great for post-event evaluation. A professional at organising conferences will be able to use their skills to fill your conference venue with the right kind of guests and delegates by deploying all the marketing skills at their disposal. Conference management can be very stressful, especially if it is something you have never done before. Hiring a planner will enable you to become involved in the event planning at a level with which you feel comfortable. You will then be able to be relaxed enough to hopefully release some creative energy, rather than feeling swamped with all the intricate details. Let a professional conference planner get you the best deals when it comes to booking a conference venue and suppliers. You can take advantage of their connections. A professional planner spends their life cultivating business relationships with hotels, airports, caterers, florists and vendors. When you hire a conference management expert, these connections become yours. How much food should be ordered? How long does it take guests to travel from the airport to the venue? Professional conference organisers take logistic planning in their stride. Public relations, website design, media release and social media content – all can be taken care of by a professional conference organiser and can mean the difference between the success and failure of your event. Which might include details, such as registering guest’s dietary requirements or organising wheelchair access or a sign-language expert. The devil is in the detail. A professional conference organiser is an expert at conference planning and remembering all the little details that are essential to an event’s success, such as name tags for the delegates — vital if you are keen to promote networking. Using professional meeting planning services will free up time for you to spend on other projects — it is important to remember that organising a large conference always involves a great deal of time and energy. Good professional planners always take pride in delivering creative and unique experiences that exceed expectations. It is highly improbable that an amateur will be able to replicate the memorable and innovative experience that can be crafted by an expert conference organiser. As professional conference organisers are experts in their field, they are more likely to be able to predict what might go wrong — and if a disaster does strike on the big day, they are highly adept at thinking on their feet and reacting swiftly and appropriately to rectify the situation. Quick thinking by a PCO can turn a terrible situation into a positive outcome for all involved. It is clear that booking the services of a professional conference organiser is always a wise move. If you need to organise an event, please visit Congrex to find out more about our range of professional conference services.